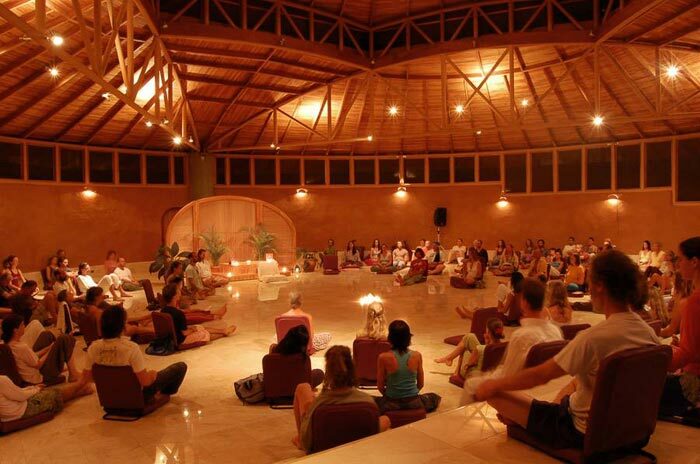 Situated in Costa Rica, PachaMama is a well-organized International community that provides perfect atmosphere of Yoga and Meditation. Tyohar, the founder and spiritual guide, conceived this community. If you are yearning for a connection with your inner self, you will find this transformation center perfect.The unique and colorful topography setting of the Pacha Mama can host many people all around the world. While staying at this community, you can make yourself rejuvenated and can get a spiritual transformation that your soul needs. This community offers classes based on Yoga and meditation and also offers several services including cleansing, juicing and detoxification. At the time staying at Pachamama, you will learn the way of getting relaxed and uniting your body, mind and soul and you will make your physical and spiritual growth to find a new meaning. If you start from San Jose, you can take one of the daily flights to reach Nosara airport that is set about 15 km from the community. After reaching Nosara, you can easily take a taxi to reach the center. If you drive, it will take 30 minute and cost $40. If you want to use car from San Jose, it will take about 5 hours. This Casita is a half open 11 square meter wooden room that is nestled near to the nature that allows the guests to stay connected to the nature. This room is featured with a full size bed with a mosquito net. There are also a shelve for clothes, a small table, a chair and a reading lamp and a fan. It is a 25 square meters cottage featured with a bedroom including queen size bed with a mosquito net, a small fridge, a small balcony, a sitting area furnished with 2 chairs and a high table. While staying at this cottage, you will also find a full bathroom including hot water facility. This cottage set within 5 minutes walking distance from the center. It is a 38 m2 size house that is featured with a bedroom with a bathroom, a small kitchen, and a living room. If you visit this place with your family, you can stay at this bungalow and enjoy a memorable family getaway. Ideally designed this 75 square meters villa is perfect for those who want to stay at this center with family. This villa is well equipped with master bedroom, stocked kitchen, spacious living room and a separate children’s bedroom. You will find the center of the village, restaurant and meditation halls with a walking distance from this villa. People who want to enjoy more adventure and visit this place during dry season, they can enjoy camping but will have their personal camping gear such as tent, air mattress, sleeping bag, bed sheets and mosquito net. During camping, you will have to use the public toilets and showers that are within walking distance. While staying at Pachamama Yoga Retreat, you will learn about Yoga as well as enjoy wholesome diet, raw food and the meditative atmosphere. In this center daily Yoga classes are offered that are designed for the beginners and advanced yogis. Pacha Mama also offers a variety of courses, workshops and yoga retreats all around the year. If you want to develop your career as a Yoga teacher, you can take the Yoga Teacher Training offered by the center. You can enjoy practicing your workouts with a group or can also enjoy individual practice at the lush forest setting or the beautiful nearby beach. Pacha Mama also offers juicing, cleansing, detoxification, therapy, self-inquiry and silent retreat. These combination of Physical, Emotional and Spiritual elements will make refreshed, relaxed and rejuvenated.